What are GSD sports you might ask? Our main focus on dog sports in this website includes articles about specific Dog Sports activities that the German Shepherd can possibly participate in. Also, "how-to" stories giving dog sport enthusiasts who own German Shepherds practical ideas on how to improve the quality of their training and competing, or how to begin in the first place. Maybe you've just heard about a particular dog activity and wanted more information. Maybe you're looking for active dog gear - like boots, backpacks or life jackets. We'll do our best to offer you that information and more here. 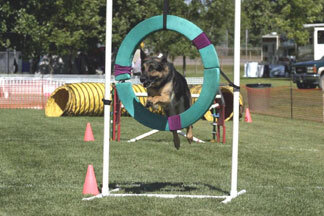 We will focus on the GSD sports of agility, Schutzhund, obedience, flyball, herding, disc dog, ring sport and more in each article below and will add more as we get the chance. Do you know of, or own a German Shepherd that actively participates in any of the various dog sports offered today? Please contact us if you do (via our Contact Us page). We'd love to post photos of your German Shepherd "in action". We will list links to more information that can be found throughout our site about the various GSD sports and activities seen below.